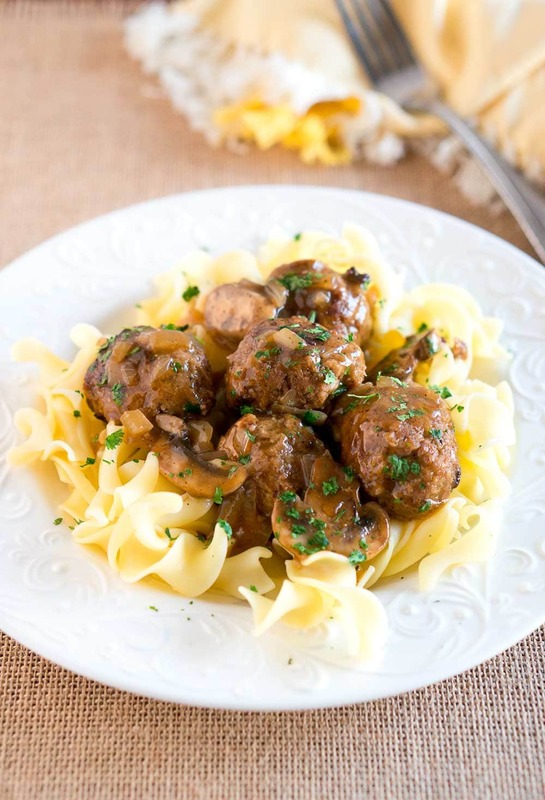 Salisbury Steak Meatballs with Mushroom Gravy is a great dinner idea for busy weeknights.It comes together in 30 min – so delicious and comforting. 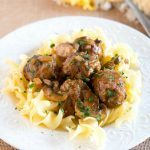 These delicious and juicy Salisbury steak meatballs with mushroom gravy are great over egg noodles, mashed potatoes or over mashed cauliflower bake. They are made in one skillet and come together in less than 30 minutes. A great dinner idea for busy weeknights. 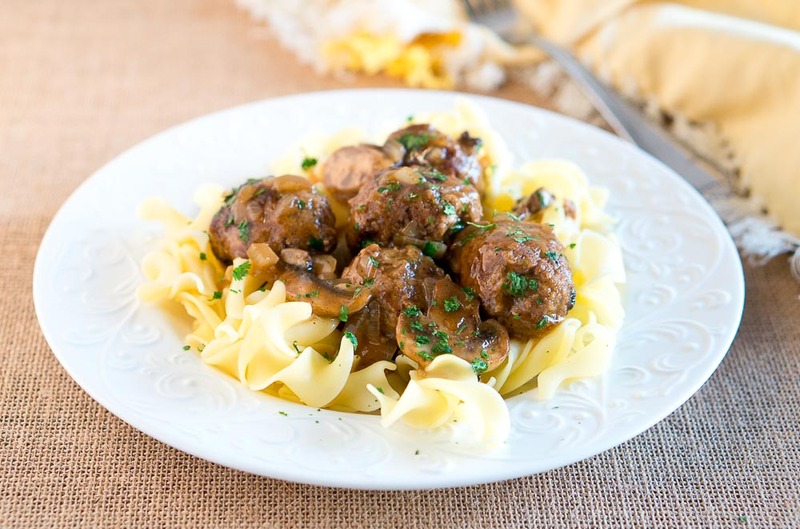 The flavors of the sauce are so good – mushrooms, onions, and beef stock. Fall is almost around the corner, and I have been dying to make some warm, juicy meatballs with delicious gravy. I can’t wait for colder days, trees changing their leaves, warm beverages, and comforting meals. These meatballs hit the spot. True comfort food made with simple ingredients. 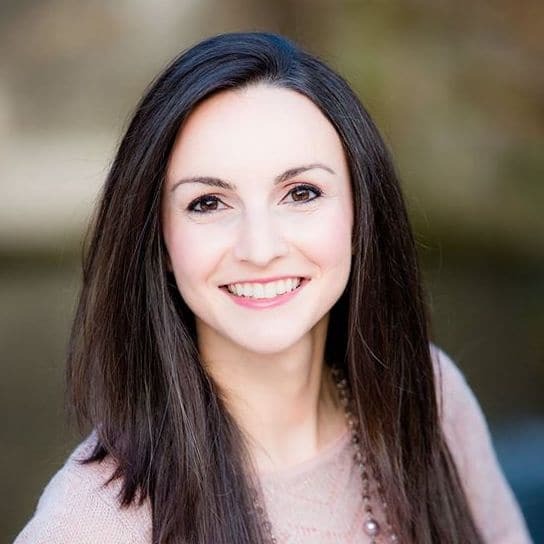 I love recipes that are simple, easy, and taste great! I think these will win you over. This recipe makes about 20 meatballs – depending on your appetite, it serves 4-6 servings. If you want to feed a large crowd, you can double the recipe. 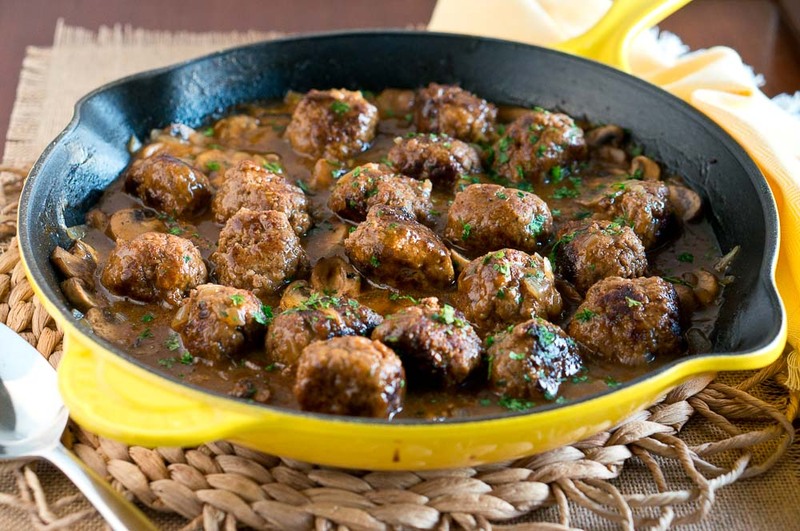 These Salisbury Steak meatballs store great in the fridge for several days. They are kid-friendly, comforting and delicious! In a large bowl, combine ground beef, egg yolks, tomato paste, mustard, Worcester sauce, gluten-free breadcrumbs; season with salt, pepper and garlic powder. Using your clean hands, mix well and shape meatballs. You should get about 20 meatballs. Melt 2 Tbsp butter in a large skillet over medium heat. Add meatballs to skillet in two batches and cook on all 4 sides for about 2 minutes per side. Add more butter if needed. Remove meatballs from the skillet and set aside on a paper towel-lined plate. Add the remaining 2 Tbsp butter in the skillet. Add onion and mushrooms to the skillet, and cook until vegetables are soft, for about 3 minutes. In a small bowl, mix together 1/2 cup beef broth and arrowroot starch. In the skillet, whisk in remaining 1 cup beef broth, Worcester sauce, and tomato paste until well combined, about 1-2 minutes. Bring to a boil, reduce heat to simmer and stir in arrowroot starch mixture. Cook until the sauce has thickened, about 1-2 minutes. Add more beef broth as needed until desired consistency is reached. Stir in meatballs. Serve warm over egg noodles, mashed potatoes or mashed cauliflower, garnished with parsley, if desired. 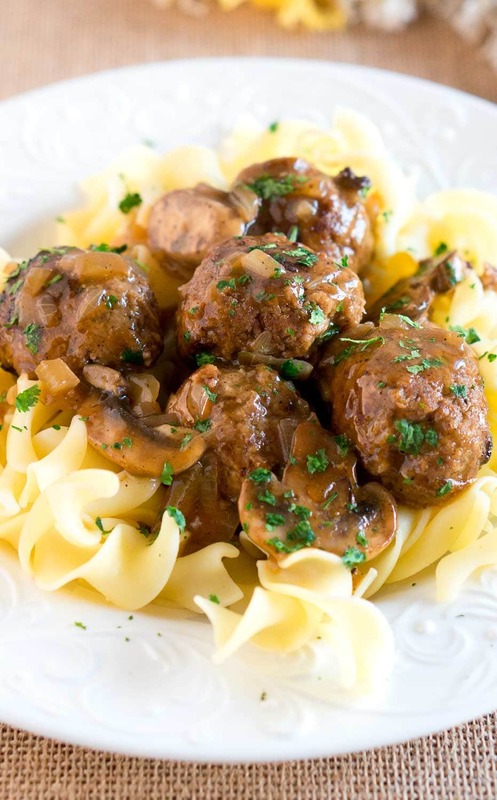 Salisbury Steak Meatballs with Mushroom Gravy is a great dinner idea for busy weeknights. It comes together in 30 min-so delicious and comforting. In a large bowl, combine ground beef, egg yolks, tomato paste, mustard, Worcester sauce, gluten free breadcrumbs; season with salt, pepper and garlic powder. Using your clean hands, mix well and shape meatballs. You should get about 20 meatballs. This looks incredibly delicious for such a straightforward recipe! I’m going to give this a try very soon! Prep and cook time take longer than stated in instructions – add extra 15 minutes. But – the result was very tasty – I will make this again!